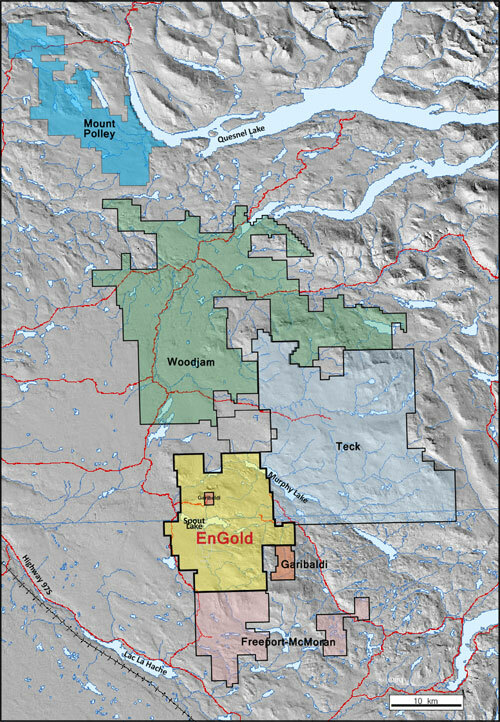 EnGold to Recommence Drilling at Lac La Hache March 23rd, Expands Land Package by 25% | EnGold Mines Ltd.
For Immediate Release. March 20, 2019. Vancouver, BC. David H. Brett, President & CEO, EnGold Mines Ltd., (TSX-V: EGM, “EnGold” or the “Company”) reports drilling at EnGold’s 100% owned Lac La Hache property in the Cariboo region of BC will recommence March 23rd, 2019, focusing on high-grade gold mineralization near the Aurizon Gold Deposit. The 6-hole shallow drilling program will target gold bearing quartz veins and silicified zones discovered on surface via 2018 soil sampling and prospecting, where previously reported hole AZS18-69 cut 12.75 gpt Au, 7.5 gpt Ag & 0.27% Cu over 1.64 within a larger intercept grading 5.82 gpt Au, 5.47 gpt Ag & 0.16% Cu over 3.9 m. Also, EnGold has added 4,908 hectares to the Lac La Hache Property by staking and purchase, increasing its size by approximately 25% to 25,750 hectares. The property expansion was undertaken partly in response to recent large-scale claim staking by major mining companies up to the borders of the Property (see map below). At-surface, gold-copper-silver mineralization at Aurizon occurs within a series of narrow, quartz-carbonate, sulphide rich veins in a number of new showings resulting from follow-up to 2018 soil geochemical anomalies, lying in the hanging wall west of the Aurizon Resource structure. The current drill program will test continuity between the new showings and possible extensions. “Our recent surface work combined with historical drill results within the very few holes which cut below the new showings, suggest continuity from surface to depths of 563 m vertically, within the new vein structure. This is separate from the previously defined quartz-vein and the Main Aurizon Resource and suggests potential for yet additional undiscovered multi-gram gold (copper-silver) veins is excellent” says VP Exploration Rob Shives. This news release may contain “forward-looking statements”. Readers are cautioned that any such statements are not guarantees of future performance and that actual development or results may vary materially from those in these “forward looking statements.” Neither the TSX Venture Exchange nor its Regulation Services Provider (as that term is defined in the policies of the TSX Venture Exchange) accepts responsibility for the adequacy or accuracy of this release.